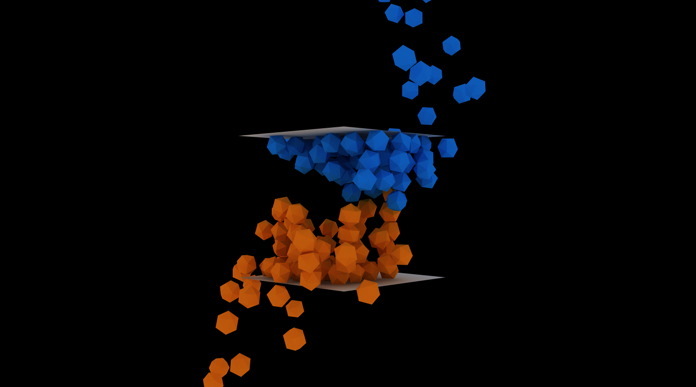 The new Cinema 4D MoDynamics is great fun, and is such a vast improvement over the old Dynamics Module. One of the things the original dynamics offers is the ability to have several independent dynamic worlds all within one scene. This is made possible by placing elements under a solver object. This gives you the opportunity to define specific forces to each solver group. For example, you can have one set of objects with low gravity and another with high gravity. 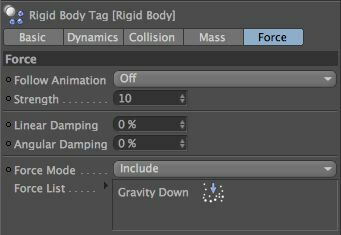 The MoGraph Dynamics has the Gravity control in the Project Settings, this defines the gravity for the entire scene. There is however a little trick you can use which offers more control and lets you set custom gravity for your dynamic objects. 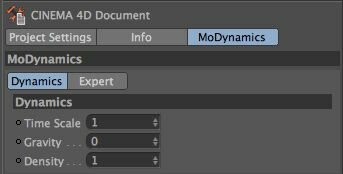 From the Edit Menu, open the Project Settings, switch to the MoDynamics Tab and set the Gravity parameter to 0. 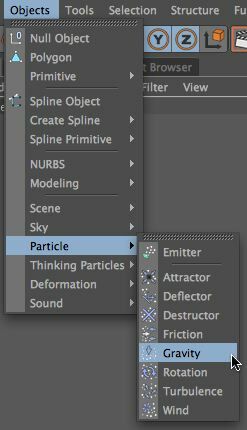 Then from the Objects Menu, choose Particle – Gravity. This will add in a Standard Particle Gravity Force. Select one of your Rigid Body tags and switch to the Force Tab. Here there is an Include / Exclude list. You can drag the Gravity Object into this list and switch it to Include. Choose another Rigid Body tag and then Exclude the Gravity from this tag. By doing this you can assign gravity to different dynamic objects. It is a pretty simple, but useful technique. You can do this with many of the standard particle forces and this allows you to add another dimension of control. Simulations are tricky to setup when you have a specific vision in mind. If you have one object that is not moving to the place you want it to, then why not employ this trick and use an attractor or gravity assigned to the problem object. Maybe that’s all you need to get the result you are after without disturbing the rest of your simulation? Great tip for using MoDynamics, thanks! Sawadee Pimaee (happy new Year) from Thailand ! other times its 120 ? I’ve done and re-done it many times, but I failed. Do you have any ideas of what could be wrong or which parameter control the duration of dynamics ? cheers, and long life to you and your tuts …. Sorry but in my tests I don’t see any freeze. It’s difficult to know what has happened without seeing a project file. Hope you sort it out! you’re really involved, that so gooood ! If you have the time to have an eye on it. I don’t know why the attraction on bubbles freeze ? Sorry but it really isn’t clear to me the problem. The bubbles don’t seem to be attracted to anything, they just bob up and down. This continues for the whole scene and doesn’t freeze. Perhaps a cut down version of the scene where the problem is more obvious might help? Sorry I can’t be more helpful here. When I use the scene Cam, on the bubbles, 3 bubbles freeze around the frame 45, only 3 of them, others still going up. In fact my first idea was to have a very very gentle and subtile atraction like helium bubbles, but first put less than -4 in the gravity object acceleration. then now it’s on -1, but some of them freeze, Maybe only on my system…. Sorry to disturb you with that problem, maybe it’s a bug ! when I say cutdown, I mean a simple version of the scene. You have many objects etc in your scene that have no direct influence over the problem and deleting them to make the project simpler makes de-bugging simpler too. It appears that the turbulence is the main reason for moving the objects and the gravity has a very small influence. If you delete the animation from the rigid body tag you can see the gravity doesn’t freeze at all. It is probably because it is set so low that it appears to do this. If you disable the turbulence and delete the rigid body keyframing you’ll see the gravity does not cause any freezes. Thank’s for explain. Next time I’ll do it. Once deactivating turblance tag, the gravity goes well. to let balls stay more or less at the same place. thank you for the time you took, lon life to yours Tuts. And Yes definitly that help ! I was wondering: With the MoGraph Rigid Body tag can you set a starting keyframe so it starts to “fall” at a certain frame? Is there are any way to stop the Gravity so the cubes don’t go farther in -y or +y ..
i mean when we active the Gravity for Example ” – Numbers ” all the cubes go up is there are a way to making them stooping and freezing from going up !! as if we stooped the Gravity they will come back to fall in the ground ! @Peter You can use a friction object to slow them down. You can also use falloff on the gravity object to restrict the affect of gravity to a specific area. I am trying to figure out a problem, when by mistake I came across this tutorial of yours. I did a similar set up when following GSG tutorial using dynamics and emitters. What I am trying to do is get the Spheres to just drop onto the floor as an ending sequence and roll forward. I am trying to achieve both effects, can you offer suggestions as to how I may get there using this similar set up? You could add a wind or gravity force and use falloff so that it doesn’t affect the spheres until they fall into the falloff area.